O.G. 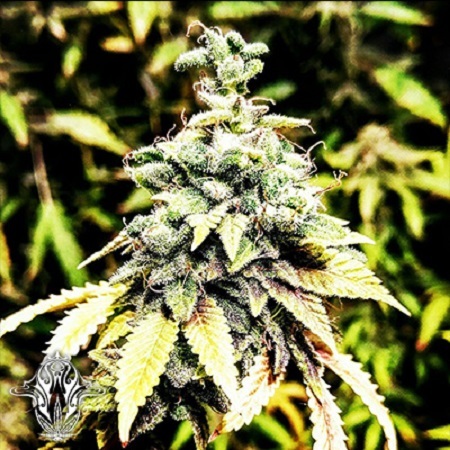 Dawg Stomper Regular Cannabis Seeds by Holy Smoke Seeds: Our mission with the Guide Dawg was to accentuate its exceptional clarity of stone added by the Tre Stardawg ..and in so doing created our most go to strain! The Grape Stomper OG's high is very very strong but it's beautifully clear and crisp definitely one of the kindest of heads we've had the pleasure of working with. The Grape flavour is amazing and the sativa in it helps push the growth spurt right up to the end of the cycle. The Guide Dawg acts like a keel on a boat it's centres it and adds a huge depth of support and clarity and really steadies the ship and keeps an even keel even when the sails are full. The dog Stomper OG is a stunning plant to grow and utilise we absolutely loved these effects kinda just never want them to end, and with the most beautiful bouquets of velvet and black grapes with a touch of Chem still prevalent on the palate, actually here's the problem as the taste is so damn nice you just want it to never end it really is that good but when it hits you you'll know you've had enough. We battled to keep this one hidden from our friends as everybody kept asking for it, but it makes perfect sense because even without these flavours the effect is so so special warm and sunny so much fun it's like sitting around the fire at night sure there's other places you could be but damn if you'll leave here right now this is such a state of bliss you will smile and you will keep smiling this strain generates huge smiles, good vibes compassion for our fellows friendship and sharing, the things we value in life! So although very strong it's comfortable actually it's comforting more than anything something you'll want to share because everyone needs to feel like this.